On PlayStation VR, explore Arizona Sunshine’s post-apocalyptic VR world using teleportation or locomotion (free) movement with any controller, and opt for optimal immersion with the PS VR Aim Controller or two PlayStation Move motion controllers to dual-wield your weapons and handle your gear and consumables with real-life movements. 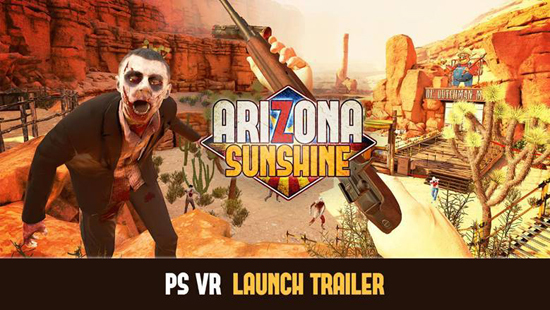 Built from the ground up for VR, Arizona Sunshine is a full-feature game that puts you in the middle of a zombie apocalypse as if you were there. Explore post-apocalyptic southwestern America in a desperate search for human contact in campaign mode, join forces with a friend in co-op multiplayer, or jump into the endless multiplayer Horde mode for up to 4 players. Experience unprecedented VR realism with physics and particle systems that provide next-level zombie mutilation, object destruction and an array of environmental effects. Step in the midst of a zombie apocalypse as if you were really there. Freely move around and explore a post-apocalyptic world, and handle motion-controlled weapons with real-life movements – putting the undead back to rest is more thrilling and satisfying than ever before. Arizona Sunshine was released on PC on 6 December 2016 and went on to earn sales of more than $1.4m in its first month of release.